Obsolete: App not available, nor maintained for years. Source code not available. 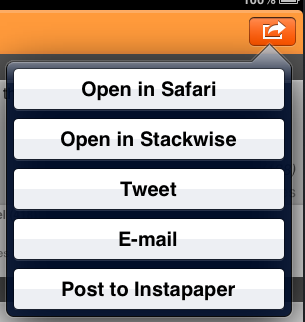 Stackwise: a new Stack Exchange browser for iOS devices. (v1.3) Now with full iOS 7.0 support! Also, check out tag subscriptions: create virtual topics based on Stack Overflow or Stack Exchange tags. 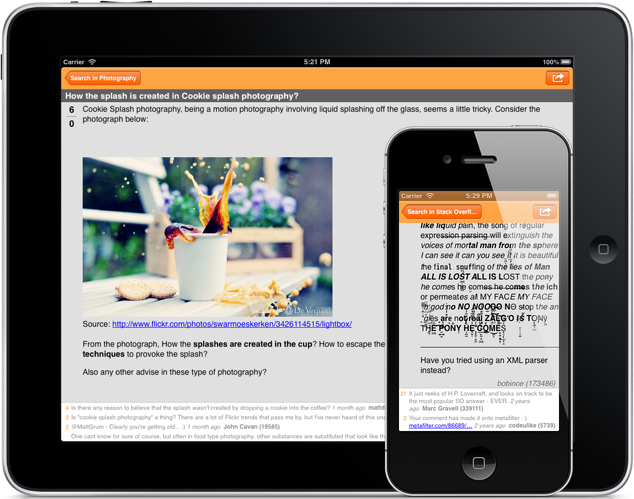 (v1.2) Now you can scroll through images embedded in questions and answers with standard pan gestures. See all the details on image-heavy Stack Exchanges like Photo.SE! (v1.1.1) Now with Instapaper support. You can tweet questions, email them or post them to Instapaper. A few months ago, I caught the Stack Exchange bug. I loved the depth of the communities, the depth of the questions, and the depth of the answers. Where else could you find out the pH feasible region for spherification, or indeed, Who Framed Roger Rabbit? 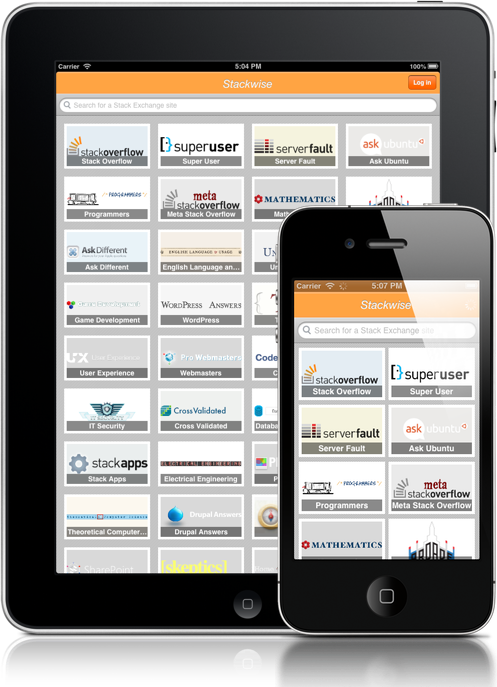 But I wanted an iOS app which could give me a bird's eye view of my favourite Stack Exchange sites, and beautifully. I wanted to see all my favourite sites, and scroll effortlessly through dozens of questions. So when I couldn't find an SE app for iOS which met my needs, I decided to make one. 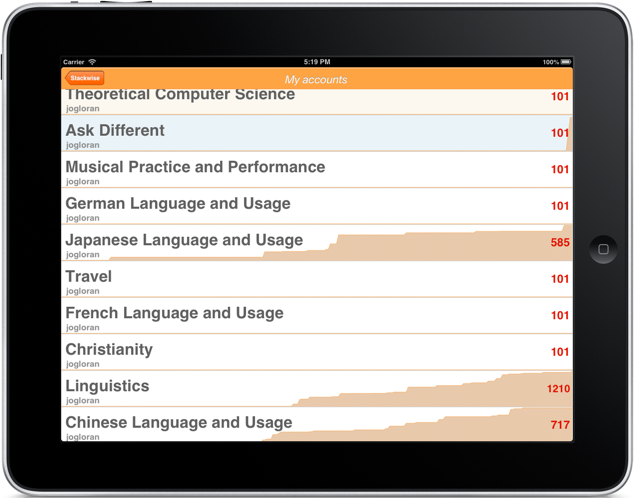 Stackwise is a free app for iPhone, and a paid Universal app (iPad and iPhone). 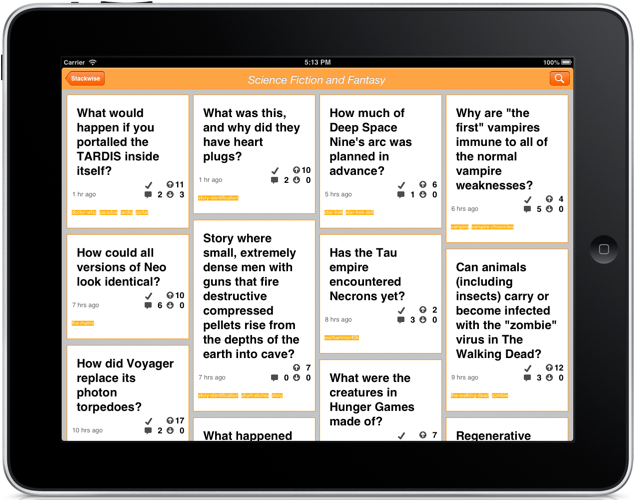 Stackwise: browse Stack Exchange in glorious HD, on both iPhone and iPad. Stackwise for iPhone (FREE! ): same great taste, for the iPhone. Try it and see! 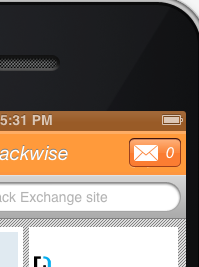 Stackwise is made for iOS devices capable of running iOS 5.0 and greater. We've also updated it for iOS 6 and the new iPhone 5's 4-inch Retina display. Tweet me at @OverpunchApps, or drop me a comment right here: I'm active on Stack Exchange after all. Bug reports, feature requests, cat videos: these have my attention. Stackwise is built from battle-tested iOS frameworks like Core Data, RestKit and DTCoreText. Every site on the Stack Exchange network, at your service. Long-press a site tile to make it a favourite. If you hang out on Meta sites, long press the Stackwise title on the sites screen to enter Meta mode. Access your Stack Exchange inbox wherever you are. A bird's eye view of your favourite Stack Exchange site. Scroll through your favourite Stack Exchange site. When you get to the end, scroll some more with infinite scrolling. Tap and hold the site title to get more info about your favourite site. Tap the magnifying glass to search on tags or keywords. We all know rep shouldn't be taken too seriously. But we like keeping an eye on it all the same. Once you've logged in, tap your user image on the main sites screen to check your rep.
Stackwise is not responsible for the summoning of the Dark Lord Zalgo. Open answers in Google Chrome, Safari, or view them right in Stackwise's inbuilt browser. Tweet or e-mail Stack Exchange questions, or post to Instapaper! (NEW). Now on the App Store. Browse other questions tagged app obsolete .